Barcelona will reportedly hope it’s third time lucky in their pursuit of Chelsea winger Willian, as they’re being tipped to try again this summer. The 30-year-old has been an important player for Maurizio Sarri this season, making 49 appearances across all competitions while scoring eight goals and providing 14 assists. In turn, they will surely have no desire to let him leave at the end of the season, although the fact that his current contract will only have a year left on it could complicate matters. According to The Telegraph, Barcelona could now try again for the Brazilian international after failing in the last two transfer windows, while it’s suggested that they could offer much less than the £55m touted bid last summer due to his contract situation. The report goes on to add that Chelsea’s transfer ban is a real problem, as if they are unsuccessful in their attempts to overturn it, they will surely do all they can to avoid seeing any of their senior stars leave the club this summer with an inability to replace them in the next two windows. As noted by BBC Sport, they have already wrapped up a £58m deal to sign Christian Pulisic from Borussia Dortmund, and so they could perhaps afford to lose a winger with the USA international acting as a direct replacement. 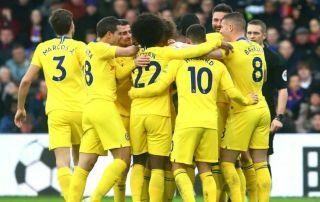 Nevertheless, if they wish to compete on multiple fronts, they’ll need a deep squad and so they could choose to keep Willian and risk losing him on a free next year. Time will tell if Barcelona submit a bid which forces them to consider their options, but as noted by the Telegraph, there are also question marks over the futures of Eden Hazard and Callum Hudson-Odoi, and so it’s likely to be an anxious few months for Chelsea fans to see who they could be forced to let go in the summer. Ideally though, their more immediate focus will be on finishing in the top four in the Premier League to secure a return to the Champions League, and to successfully appeal against their ban to strengthen rather than focus on keeping their squad intact.